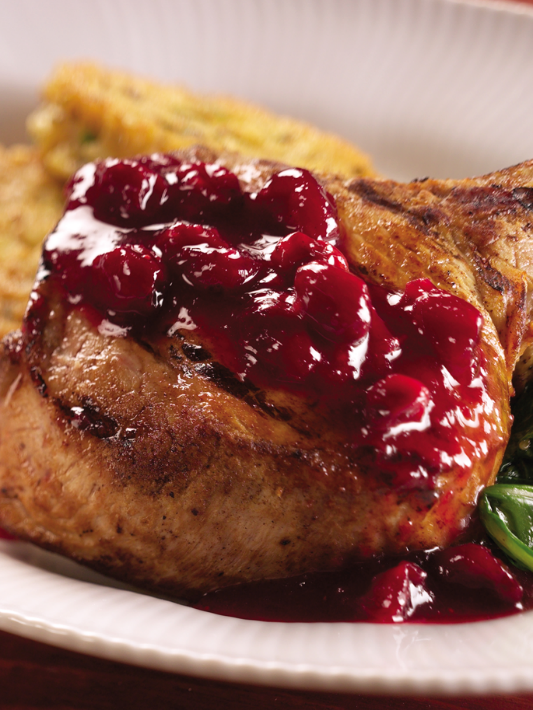 FEATURED RECIPE: WATERMELON CRANBERRY-GLAZED PORK CHOPS - What About Watermelon? There are many reasons why I like the holidays, many of which revolve around the incredible amount of food that crosses my plate during the season. For me, there’s no better way to celebrate with my family and friends than by sharing a delicious, homemade meal. The only bad part about all that holiday grub is figuring out what to do with it all. If you’re lucky, your family and friends will gladly take some of it off your hands. If not, I’ve got the perfect recipe for you. Got some leftover cranberry sauce? With a few additions, you could turn it into Watermelon Cranberry-Glazed Pork Chops. Simmer ingredients for glaze together in a heavy saucepan for 20 minutes or until cranberries are tender, and sauce is thick. Place the pork in a large zipper lock bag with rest of the ingredients (except the glaze), and seal tightly. Allow to marinate for at least two hours or up to 12. Grill until cooked, and arrange on a warm platter. Pour the glaze over the chops, and serve immediately. UP NEXT: WHY SHOULD YOU WASH YOUR WATERMELON?